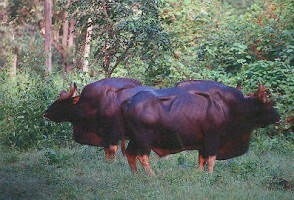 The Gaur or Indian Bison as it is sometimes referred to, is the largest of all wild cattle. Gaur are very impressive creatures with a big bull standing 6 feet at the shoulder and weighing a little over a tonne. Cows are a reddish brown in colour and have short hair. Old bulls are black in colour and almost hairless. Both bulls and cows have a prominent muscular ridge (dorsal ridge) running from the shoulder to the middle of the back and this is very pronounced in mature bulls. The bulls also have a dewlap below the chin, and a larger one between the forelegs, which is bigger and hangs lower in the older bulls. Both males and females have white 'stockinged' feet. The almost semi-circular horns are yellow at the base, and tipped with black with a greyish ridge connecting them. The horns are wider and bigger in the bulls. Measured along the curve, the average sized spread is about 68 to 76 cms (26.7 to 30 inches). in the Western Ghats, Gaur are also found in Anamalais, Bandipur and Mudumalai Wildlife Sanctuaries.Primarily animals of moist hill forests, they are even found at heights of 6000 feet (1830m) or more. They are very much at home in the shola-grassland habitat of the Western Ghats and emerge in the late evening from the sholas on to the grassland to graze. In some parts of the country, Gaur keep to higher ranges, descending to the plains only in certain seasons. At Kanha National Park in central India, Gaur are seen in the plains country between March and June. Bandhavgarh National Park had a small population not so long ago, but their current status is unknown. Essentially creatures of the forest, Gaur are both browsers and grazers. They live in herds and range over a large forest area, moving around as per the demands of the season. Typically, they emerge from the forest to graze early in the mornings and in the late evenings, retiring into deep shade during the hotter part of the day. aspera, Grewia hirsuta, Helicteres isora, Butea parvifloara etc. They also browse on leaves and soft twigs of tall shrubs and trees such as Cordia myxa, Grewia tiliaefolia, Zizyphus and Emblica ssp. and Ardisia solanacea. Young bamboo shoots of both Bambusa arundinacea and Dendrocalumus strictus are also relished. Fruits of Aegle marmelos, Cassia fistula, Gmelina arborea, Emblica ssp. and Terminalia bellerica are also eaten. Gaur generally drink at least once a day, and are likely to emerge at preferred water points on a regular basis, and more so during the summer months. Like all herbivores, they are also regular visitors to salt licks, both natural and man made. 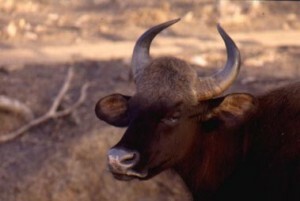 As with most cattle the Gaur posses an acute sense of smell. Their hearing and eyesight though good are probably not as sharp. The Gaur's formidable size means that they have few natural enemies with the Tiger (Panthera tigris) being the main natural predator. At Nagarahole National Park, Gaur are known to be a regular feature of the Tiger's diet. However, they are not easy prey and there have been occasions when a herd of Gaur, having scented the Tiger, have easily succeeded in seeing it off. When alarmed they react by a harsh blowing of air through their nostrils and produce a snorting sound. Gaur live in herds which average from 6 to18 individuals, but herds of upto 40 or more, have also been reported. A dominant male heads the herd, which has a number of cows, calves and sub-adult males. Mature bulls that are not part of a herd lead a solitary existence. The rut extends through November - December and it is during this season that the forests are filled with the rutting calls of the bulls. For an animal so huge, the call of the male is a very incongruous long high pitched whistle, which descends to a lower tone towards the end advertising his presence. Bulls assert their dominance by posturing and parallel walking, showing off their profiles to which the dewlaps and the dorsal ridge add much grandeur. While this settles the hierarchy in most cases, two equally matched bulls may lock horns in a head to head combat to assert dominance. Single calves are dropped after a gestation period of 9 months in August and September. The new born are light brown in colour and minus the trademark 'stockings', which they acquire after 3 months of age when their coat also turns a darker brown in colour. The calves are completely weaned when they are between 7 and 9 months of age. 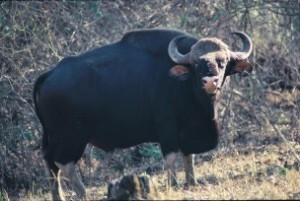 Perhaps the major threat to Gaur is the continuing shrinkage and degradation of its habitat. In many Protected Areas and even some National Parks, domestic livestock actually compete with Gaur for grazing. Besides this, domestic livestock are also carriers of serious diseases such as rinderpest and foot-and-mouth, with which Gaur can easily be infected. Protection of its habitat and vaccination of livestock in areas around National Parks and Protected Areas and strict enforcement of anti poaching measures, including ingress by domestic livestock is essential for the long term well being of this magnificent creature of the forest and hills.